–Nancy Stark Smith Editor’s Note: Moving Without A Body? Contact Quarterly. Winter/Spring 2014. 39 (1). 3. Role: Creative Producer. Project Description: An experiment in embodied learning and co-creativity on the internet. Co-created with Marlon Barrios Solano. Collage of screenshots from the first Meta-academy pilot by Rachel Boggia and Marlon Barrios Solano. Meta-Academy investigates online learning as simultaneously an embodied creative collaboration and a unique pedagogical opportunity. It creatively explores the implications of collaborative creation in networked environments for the humanities. In simple language, we use free, massively available platforms such as Google+, flickr, and YouTube to enable collaborative, creative learning around a core idea, community, question, or expert. We call each collection of activities, resources, and discussions a lab. Rather than broadcasting existing realms of thought into the online space, Meta-Academy works to translate ideas and practices into activities that only exist online. Meta-Academy produces a low-hierarchy alternative to the MOOC (Massively Open Online Course) in which all participants are treated as contributing artist-scholars. It is free, hosted by the social network dance-tech.net and is open to all interested parties. Meta-Academy increases the digital literacy skills of its users by providing well-documented instructions and granular, step-by-step activities that allow participants of all levels of digital literacy to participate easily. No specific experience or environment is necessary, other than an Internet-enabled computer and webcam. My collaborator, HZT Berlin Associated Researcher Marlon Barrios Solano, originally conceptualized Meta-Academy, but the project remained theoretical until I joined him as an equal partner and creative producer in the spring of 2013. Online education expert Josephine Dorado (The New School, New York) signed on to collaborate with us on the first pilot of Meta-Academy. I work with my collaborators to plan each lab, to recruit and interface with experts, to research new online learning and interaction tools, to write assignments, and to host discussions and google hangouts. I also have initiated grant-writing and fundraising for the project (see grant applications at the bottom of the page). Meta-Academy brings together my interests in digital technology and dance documentation with dance pedagogy and online education at large. This is an original area of research that is breaking new ground for the dance community and can be a voice for embodied learners in the fast-growing arena of online education. There have been three major Meta-Academy Labs. The first pilot for Meta-Academy, entitled ”Meta-Academy@Bates 2013: Minded Motion Lab“ focused on collaborating with master dance improvisation teacher Nancy Stark Smith to translate elements of her Underscore to the online space. We asked the question, “What does a collaborative, embodied practice like the Underscore look and feel like if transposed to the internet with all its connective, social, visual, remixing and re-sampling capabilities?” July-August, 2013. Dance festivals create intimate, hyperlocal communities where dancers exchange creative processes, pedagogies, finished work, and ideas. In 2014, Meta-Academy connected three dance festival communities to each other, and opened them to users at home. Meta-Academy invited users to engage online with three international dance festivals in the summer of 2014: Taking Place (July 1-13 in Columbus, OH, USA), Impulstanz (July 21 -August 18 in Vienna, Austria), and Bates Dance Festival (July 21-August 11 in Lewiston, ME, USA). We also participated in IDOCDE, and international symposium on contemporary dance education (August 1-3 in Vienna, Austria). June-August, 2014. Meta-Academy@HZT-Bates is an online lab investigating the potential of networked environments (from internet to mobile devices) for performance, contemporary choreographic practices, and collaborative knowledge production. The participants will explore online resources and cutting edge digital internet technologies to remotely connect, perform, register, aggregate, map and visualize the knowledge articulated in their own creative/artistic practice and research. Online lab activities include synchronous encounters, discussion forums, individual and collaborative projects and a presentation of final projects. This project is supported by the Whiting Fund though through the Office of the Bates College Dean of Faculty. September, 2015. The first two labs are outlined in some detail below. The most recent lab is not analyzed here. Role: Creative Producer Description: A three week online lab supported by the Bates Dance Festival and focused on the Underscore by Nancy Stark Smith. July-August, 2013. The first pilot for Meta-Academy, entitled “Meta-Academy@Bates 2013: Minded Motion Lab,” focused on collaborating with master dance improvisation teacher Nancy Stark Smith to translate elements of her famous Underscore to the online space. Stark Smith has developed the detailed Underscore since 1990 as a vehicle to incorporate contact improvisation into a broader improvisational context. It is practiced worldwide in a three+ hour focused sessions and has more than twenty phases. The score is usually disseminated through oral tradition: Stark Smith or her chosen students teach the score in a separate session preceding practice. Stark Smith also published the phases of the Underscore in her 2008 book, Caught Falling. Stark Smith taught a course on the Underscore at the 2013 Bates Dance Festival. Barrios Solano and I both took the course, then met with Stark Smith several times per week to discuss which elements of her pedagogy would be beneficial to translate to the online space, and to shoot videos of her teaching. 66 participants from all over the world signed on to participate in the online experiment free of charge. The course approached the Undercore creatively and critically organized into five major activities: embodied activities, online creative activities, threaded discussions, video chats/lectures with experts, and online synchronous video encounters with lab peers. All media was produced under creative commons share alike licensing. What follows is an outline of the core content of the lab. All course activities can be viewed and tried at the original lab site here. Meta-Academy@Bates 2013: Minded Motion Lab featured creative activities and critical investigations that branched out from a central video interview in which Nancy Stark Smith describes and discusses the Underscore in detail. Significantly, this is the first time Stark Smith shared/taught the full Underscore online. We asked participants to “tag” the video by writing keywords as they watched. Then we asked them to make word clouds of their tags through the website wordle.com. Here are a few of the many word clouds created. See all the responses here. Nancy Stark Smith helped us start a collaborative resource commons of articles and videos. Other scholars and lab participants added to the bibliography. Each week, we posted a video of Nancy Stark Smith teaching an improvisational dance skill translated for the internet. We asked participants to respond creatively to the embodied activity. Links to all three embodied activities with student responses can be found here. Online creative investigations are activities in which particpants use an online tool to create responses to lab materials and prompts. They often involve gaining digital literacy skills while also engaging in creative or critical activities. Examples are collaborative tagging (see core video above) mind mapping, online video editing, thick video editing, and collaborative drawing. Participants met up in google+ hangouts to follow Stark Smith’s Embodied Activity #3. They also met up in help chats through google+ hangout. 66 participants from four continents collaborated in the lab with zeal and creativity. Many were dancers, some BDF alumni, some students of Nancy’s, and some were researchers in other fields. They reported increased understanding of the Underscore, digital literacy, creative connections with others across the world, and finding new nuances on the experience of embodiment in relation to the computer interface, their creative work and theoretical approximations. More than 20 hours of video content were created, as well as writing, images, and other forms of creative and critical output. All activities and outcomes can be seen (and tried) at http://www.dance-tech.net/group/meta-academy-bates-2013. To directly connect our local and online communities, Barrios Solano, Dorado, and I organized an open lab/gallery showing of works at the conclusion of the Bates Dance Festival. Lab participants were present in Google+ hangout while Bates Dance Festival participants perused the work. In addition to positive feedback from lab participants and the Bates Dance Festival community, we have received enthusiastic response from the field. Meta-Academy is featured in the Winter 2014 Edition of Contact Quarterly and on the Bates Dance Festival Blog. We presented our research as part of the “Community of Practice” in choreographic documentation at Motion Bank Live and On Line (L.O.L) 2013 in Frankfurt, Germany in November, 2013. This was a significant honor, as Motion Bank is one of the premier centers of research on choreographic documentation in the world (see supporting documents). Role: Creative Producer. Description: The second pilot for Meta-Academy connected three dance festivals (The Bates Dance Festival, Impulstanz, and Taking Place) for conversations between teaching artists on pedagogy and creative process in contemporary dance. June-August, 2014. Dance festivals create intimate, hyperlocal communities where dancers exchange creative processes, pedagogies, finished work, and ideas. 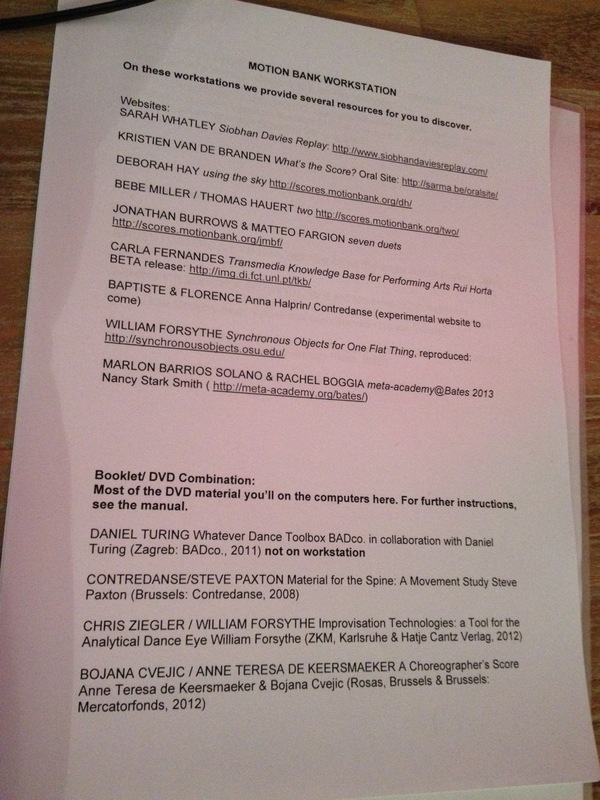 In 2014, rather than focusing on translating the work of a single artist (as we had the previous summer), Meta-Academy Impulztanz-BDF 2014 connected three dance festival communities and opened them to users at home. Meta-Academy invited participants to engage online with conversations between teaching artist at three international dance festivals Taking Place (July 1-13 in Columbus, OH, USA),Impulstanz/IDOCDE (July 21-August 18 in Vienna, Austria), and Bates Dance Festival(July 21-August 11 in Lewiston, ME, USA). Teaching artists included Peter Kyle, Kj Holmes, David Zambrano, Kerstin Kussmaul, Jennifer Lacey, Alice Chauchat, Rio Rutzinger, David Dorfman, Angie Hauser, Chris Aiken, Alexis Eupierre, Kerstin Kussmaul, Barbara Meneses, Stephan Koplowitz, and Meredith Lyons. We also offered an embodied online activity through Bebe Miller. All activities are outlined below, and can be seen in their original form here. Hour long conversations between teaching artists present at each of the three festivals were the major activity of Meta-Academy 2014. These conversations were moderated by Barrios Solano or I and were open to other lab participants to join in via video or text-based chat. The video archives of the conversations were embedded in a threaded discussion so that the conversation could continue after the video chat had ended. Peter Kyle and Kj Holmes- Teaching and Creative Practice at Taking Place, Columbus, Ohio. Two teaching artists embedded in the Taking Place festival in Columbus, Ohio, discussed their pedagogy and creative practice with remote participants from Vienna and the around the US. Contemporary dance teachers David Zambrano, Kerstin Kussmaul, Jennifer Lacey, Alice Chauchat, and Rio Rutzinger (ImPulzTanz); David Dorfman, Angie Hauser, and Chris Aiken (Bates Dance Festival) discussed their ideas, perspectives and research on dance teaching and dance education. Faculty from Bates Dance Festival and Impulstanz discussed teaching contemporary dance. This week our conversation was shaped by Improvisor Chris Aiken, who presented ideas on gesture and pre-gesture. Then our panel of guests included Alexis Eupierre, Kerstin Kussmaul, Barbara Meneses, Stephan Koplowitz, Meredith Lyons. 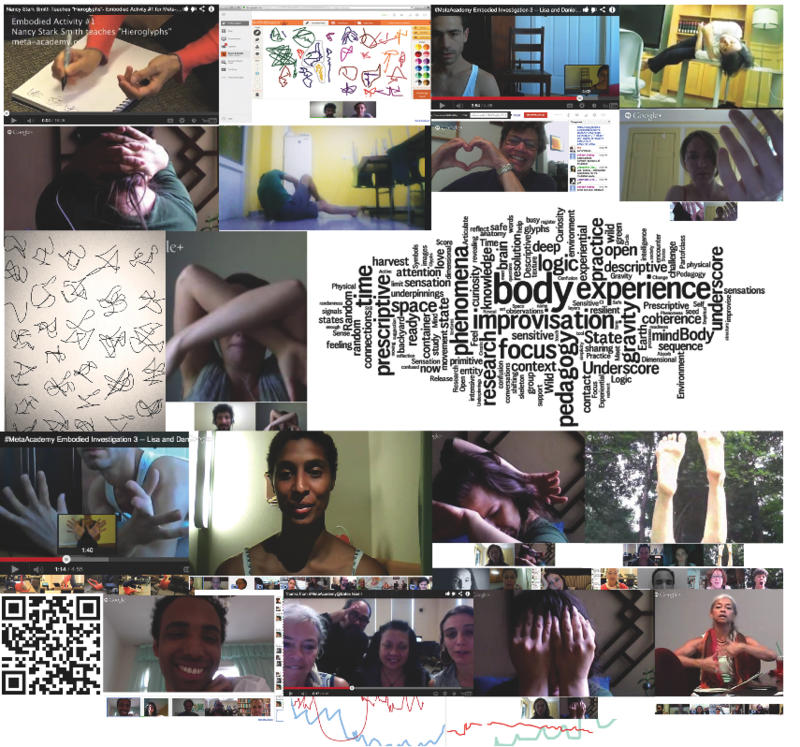 We offered one activity for online embodied experimentation in 2014. Choreographer Bebe Miller graciously allowed us to share a her practice “watching watching,” which she developed through her 2008 work Necessary Beauty. The movement vocabulary for this activity includes videos of Bebe improvising in summer 2014 and text options culled from her 1993 work Nothing Can Happen Only Once. These materials are also used in her new work for Taking Place, which was in rehearsal for performance July 11 and 12, 2014. We asked participants to video themselves responding in real time to watching to any and all of the videos and/or hearing sound scores and to post their responses on our site. The entire assignment and responses can be seen here. Boggia, Rachel. The First Pilot for Meta-Academy Brings the Jam Online. 18 October 2013. Kraus, Lisa. Marlon Barrios Solano: Drawn to the Screen. ThinkingDance.net . Yergens, Ashley. Tech-Savvy Dance Education. Bates Dance Festival Blog. 30 July 2014.